A Golden Retriever for your family? Drumtreve is an NZKC (New Zealand Kennel Club) registered kennel. We are a member of the 3 Golden Retriever Clubs in NZ, along with several Gundog Clubs. Drumtreve dogs are all fully health checked and certified. Drumtreve strives to have quality dogs with excellent temperaments. Drumtreve follows the principle of "Open Register" meaning we declare any known health issues, and strive to minimize the risk of any. Genetic screening is a tool which adds more knowledge for making well-informed decisions regarding any breeding options, and this is something that here at Drumtreve we are now beginning to test, as the ability to do so becomes available. Potential health issues are manageable through good breeding practices, albeit meaning difficult decisions at times. Here at Drumtreve the dogs are raised to fit easily into a relaxed, yet busy and sociable lifestyle. Drumtreve dogs are competitively campaigned in breed shows. Immense thanks to Lindsey Davies (Schiehallion kennels) for her help in caring & showing the Drumtreve dogs. And….just occasionally the dogs decide it is OK to entertain themselves, whilst others are hard at work. But mostly they love to be out and about - check this clip! Although this website is about the Drumtreve dogs, we have Fergal. 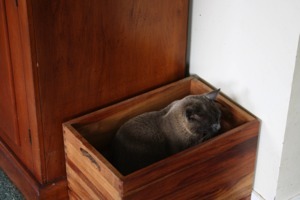 Fergal is a burmese cat - a bit of an incorrect color (chocolate blue) he is from Ttobormory cattery in Pirongia. He came to Drumtreve when we went to visit our new kitten …..and we came home with the irresistible Fergal - then the new kitten a few weeks later……Sadly Fergal actually thinks he is a dog. Or at the very least an object of the dogs' attention - yes this is him in one of his favorite sleeping spots…the dogs toy box in the living room. He sleeps there most nights and it is a very strange twist….when Fergal is asleep - there is NO retrieving of toys. You will see Fergal is very much a part of Drumtreve in the pictures throughout this website. He does earn his keep and respect from the dogs though, regularly bringing home rabbits (almost as big as him) . He kindly shares his spoils with the gang. 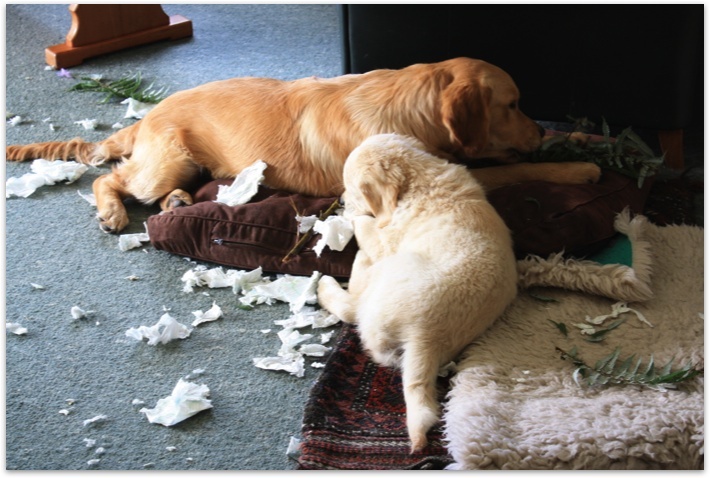 Drumtreve is a boutique NZ kennel, specializing in breeding beautiful Golden Retrievers. However we do have a bit of an eclectic selection of gundog breeds! Based just out of Waihi, New Zealand, live on an organically certified property (about 16 acres). Waihi is based at the foot of the beautiful Coromandel Peninsula, and about 15 minutes from the famous surf beach "Waihi Beach". Waihi is primarily a gold mining town, with NZ's largest operating gold mine right in the centre of town. Golden dogs for a golden town! We pride ourselves on breeding for temperament and correct form. Golden Retrievers are the ideal family dog: loving, obedient, relaxed, and yet full of life and energy when needed. They are an immensely handsome breed, and wonderful companions for growing children and their adventures in life. Here at Drumtreve all our dogs are an integral part of the family. They are both house and kennel dogs - but mostly lay about the office dogs! All dogs are competitively campaigned in breed and specialty gundog shows. In addition to the Goldens we also have a flat-coated retriever, a gordon setter and of course Fergal the burmese cat (who thinks he is a dog!). The hens live in the paddock behind the kennels, providing amusement and delicious egg treats for the dogs. I hope you enjoy visiting this site.